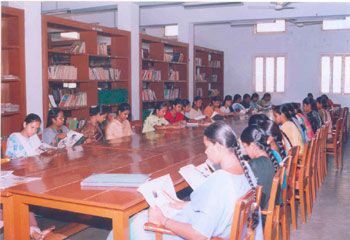 Sri GVG Visalakshi College for Women was established in the year 1952 and it is a Government Aided Womens Autonomous Institution affiliated to Bharathiar University. About five decades ago, in 1952, Sri G.V.G Visalakshi College appeared on the academic map of Tamilnadu as the first Women’s college in Coimbatore District. Set in idyllic environs the stone edifice of the college stands as an eternal monument of the philanthropy and foresight of the founder Sri G.V. Govindaswamy Naidu, who envisioned a futurity of emancipated women hood of the socially, economically and culturally backward rural society of Udumalpet in his days. His posterity, the correspondent Mrs.G.Rajalakshmi and the Managing Trustee, Dr.V.Genguswamy Naidu have fostered and nurtured the spirit of their sire over the years enlarging the scope and variety of higher education offering a multiplicity of traditional and modern courses. The story of the growth of the college is one of gradual uphill ascent to the summit of excellence.